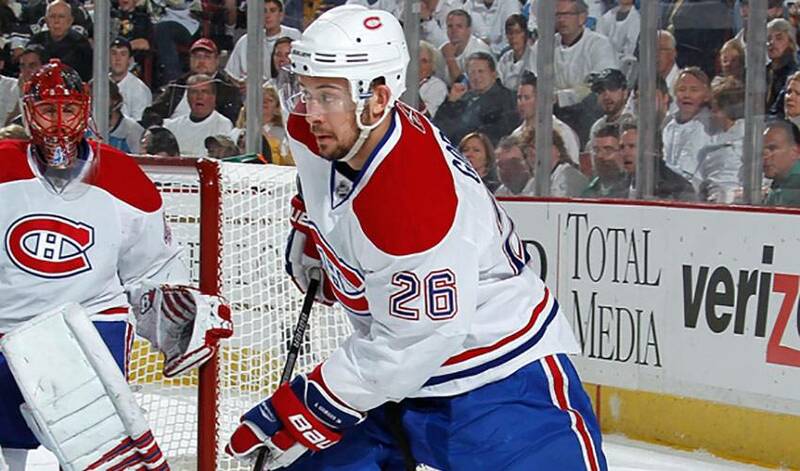 The steady defenceman has played a crucial role in the Habs success this spring. His dedication to strong defensive play and his willingness to sacrifice his body is one of the reasons the Habs are now in the Eastern Conference finals. He's seen him battered, bruised and beaten down, but Bruce Hamilton knows when it comes to Josh Gorges, you can't keep a good man down. If everything that had been said in the past about Gorges were true, he would never have made it to the NHL, let alone thrive at the game's premier level. But Gorges, now in his third full season with the Montreal Canadiens, is not the type to accept defeat, regardless of the circumstances. Gorges was a major factor in helping his hometown Rockets to a Memorial Cup championship in 2004 as their captain, where he was awarded the George Parsons Trophy as the Most Sportsmanlike Player in the tournament. Gorges will to succeed is by no means a new character trait. Undrafted, Gorges was given a shot to make the roster with the San Jose Sharks in 2002. Again, it wasn't so much skill that won over the Sharks, but rather, it was his willingness to outwork and outhustle others that earned him a spot on the Western Conference club's defensive corps. It's something fans of Les Habitants have come to admire in Gorges since he arrived in Montreal via a trade with San Jose on February 25, 2007, dealt with a 2007 first-round pick (Max Pacioretty) for Craig Rivet and a 2008 fifth-round pick (Julien Demers). On July 9, 2008, Gorges signed a three-year contract worth $3.3 million with the Canadiens. One lesson that has remained with Gorges is in not forgetting his roots. Every summer, he returns to Kelowna and during his stay, he is a fixture at the Rockets' home rink, lending not only his time, but his voice to his alma mater. And as Hamilton came to discover during Gorges time in Kelowna, he's also well-versed in being a top-notch leader. “Josh will defend his teammates in a heartbeat, on or off the ice,” offered Hamilton. “He doesn't leave anything on the table. He's a no-nonsense guy who only wants what is best for the team. But in defending his teammates, he will hold you accountable. Honour is a big thing for Josh. How far the Habs go in this year's playoffs remains to Gorges' track record for success and his inspiring attitude, a shot at the Stanley Cup is not out of the question. And as Hamilton will happily remind you, Josh Gorges is proof that you can't keep a good man down.